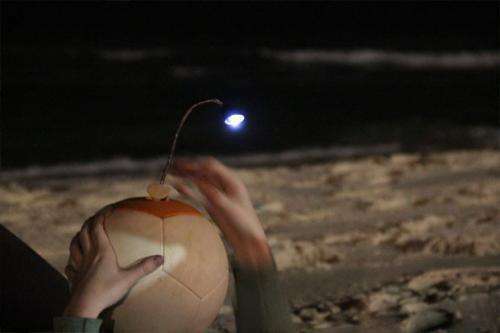 (Phys.org) —A collaboration between groups Uncharted Play and Power the World, has resulted in the creation of a soccer ball generator they call the SOCCKET—when used, it generates enough electricity to power an attachable LED lamp for up to three hours. 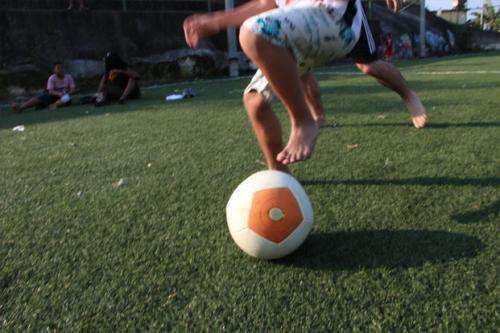 The team has been testing their ball for over a year in impoverished regions of North and South America and are ready to begin mass production—but to do that, they need investment funds, which is why they've created a Kickstarter project. The SOCCKET is a simple yet brilliant concept. 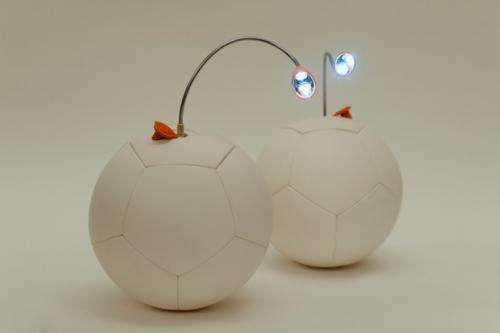 It's a soccer (football) ball made of EVA foam with a pendulum-like mechanism inside that converts movement into electricity to charge a small battery. A small LED lamp can be attached to the ball once the battery has been charged to provide light—playing with the ball for just 30 minutes is enough to produce light for up to three hours. The SOCCKET is the result of over a year of tinkering with the basic design, in its current form, it weighs 17 ounces—just one ounce more than a standard soccer ball. It's airless, which means it can be used (played with) without need for a pump and won't ever go flat. It's waterproof and manufactured in the United States. The team is seeking $75,000 to develop a manufacturing process to mass produce the balls which should lower their cost dramatically. Currently, those willing to "donate" $89 or more to the project can get one for themselves. But that's not the point of course, the whole reason for developing the SOCCKET was to provide people who are going without light at night (for whatever reason), a simple, fun and easy way to power a lamp that can be used for a full evening. This way, children, adults or a combination thereof can power their light source while having fun playing soccer, a sport that can be played nearly anywhere there is a reasonably flat surface. Members of the team say on their Kickstarter page that they are looking into adding a USB connection to the SOCCKET so that devices other than just the lamp (such as cell phones) can take advantage of the charged battery. That will depend, of course, on how well their funding effort goes. Or for £10 (uk retail) you can buy a 12-LED wind-up lantern that works for hours on a 3-minute windup. I appreciate that people who can't afford electricity may not have £10 to spare, but I suspect a more cost and labour-effective way of providing basic lighting may well already be available. Hand powered crank flashlights are cheap as are regular soccer balls. I do not really see the advantage of combining the two and creating one more expensive product. I mentioned this as a possibility a number of times, muscle powered generators, usually fitted with a flywheel to store energy, operating in a magnetic field, connected to a raft of batteries, and I was mocked with allusions to the bicycle operated generator on "Gilligan's Island". If you think about it, a few hundred people working together should be able to produce the same output as, say, a Hoover Dam. A source of power, a growth industry and a potential producer of jobs. Of course, another point can be raised. God providing the necessary coal, oil and natural gas source of power to give a human race that can contribute time off to contribute. Should the human race acts solely selfishly and not nobly, conditions may change to make constant devotion of their time to energy production crucial. That way, at least they'll provide something to the world. Incidentally, if a soccer ball absorbs energy of play, that indicates it not converting movement to flight. a few hundred people working together should be able to produce the same output as, say, a Hoover Dam. The british show 'bang goes the theory' had a special where they human-powered a house with bike-generators for a day. It totally wore out 100 people. Unfortunately, you aren't the first to 'invent' this idea. Again with the bike generators! Biking is not a minimally demanding process! That's why it's used as a weight loss exercise and not working a lever, which is what I was suggesting. And, face it, where is the proof that this television show can be trusted? Where is the affidavit of their absolute veracity? They don't want people to think that this can be an effective means of generating electricity, so they siphoned off what electricity was generated or they simply didn't have the bicycles rigged up as generators. And, remember, biking, as I said, is more tiring than other methods that can generate electricity mechanically. Wind turbines are supposed to be so forthcoming. Several people standing on a scaffolding with grppling hooks could keep a turbine going. The soccer ball must remain carefully balanced, some pendulum in it would make it unusable. These gadgets just illustrate the decadence of 21st century technology, which invents useless expensive toys instead of helping people in cheap and effective way. Are you serious? I mean do the math. Thats 1.79*10^12 Joules every 24 hours. In Earths gravity (10m/s-2) moving 1kg of mass 1 metre in the air requires 10Newton Meters of work or 10 Joules. That means to get the equiv energy of the Hoover Dam, we would need to do work equivalent to raising a 1kg mass 1 metre against gravity 1.79*10^11 times, if we wanted 'a couple of hundred' people.. lets say 1000 to make the calculation easier, we would need them to raise 1kg against gravity to a height of 1m 1.79*10^8 times per day, which is 2071 times per second (or move 2.071 tonnes per second if you prefer). Even if all 7*10^7 of us humans did it, we would still need to raise 1kg 25 times per day EACH just to equal one large dam which is a small percentage of the global energy budget. So stop being stupid and learn some maths. I think the idea is that its fun and useful, rather than just being a chore. The intended market will probably kick anything around for fun, but be unable to afford one. A few may be sold for novelty value to a market that don't need them and will soon get bored with them. How many people own a wind up torch and never use it because its far to easy to get batteries. I do, and its like 30 minutes winding for 3 minutes power. When ever you need it, its gone flat with the self discharge, so not really an investment for an emergency. Rated at about 4 billion kilowatt hours a year, Hoover Dam actually produces about 10.95 billion watts per day. Several hundred people would represent 36.5 million watts apiece, which, spread over 86400 seconds, is 422 joules of energy every second, and that works out to approximately 42 kilograms or about 95 pounds each being raised 1 meter against gravity. And, again, depending on how the energy is applied, it can be different for the person. Using a cranked system, it can be less of a strain than moving something straight up and down. And, if an hydraulic jack is used, it can represent less exertion for the individual. And the bicycle system still is more tiring than the cranked system. As an aside, note StarGazer2011 using the term "maths". The correct diminiutive for mathematics is "math". It's unsure how the incorrect term was adopted or why those who supposedly understand the world around them are using it. From Wikipedia, the Hoover Dam produces an average power of 4.2 TWh / Year (terrawatt-hours per year), corresponding to an average instantaneous power of approximately 500 MW. The average "in-shape" cyclist, again according to Wikipedia, can generate approximately 200 W for about an hour (more if instantaneously, but thats not useful for this, we need sustained power expenditure). Therefore, it would take nearly 2.5 million cyclists to generate the average power of the Hoover Dam. And, once again invoking a bicycle shaped generator. A hand cranked system, working with a form of lever, can start up a superheavy flywheel immersed in a magnetic field so the wheel will keep turning with minimal, sometimes even no, input for a period of time. People generally can generate more power with their arms than with their legs. The insistence on invoking a bicycle generator instead of discussing what I have described is proof that there are those who don't want it considered, probably because they are working on their own patents for it now! And the tendency of so many not to discuss the ideas I have mentioned only whows how eager they are to be used by the rich and corrupt. I spoke of God providing oil, gas and coal so those who understand the world around them don't have to work endlessly just providing power. When the crooks are allowed to win, as when others do not challenge the bicycle system, it can bring us closer to God removing supports. People generally can generate more power with their arms than with their legs. I swear, you're just making things up as you go along. Try this: measure the diameter of your arms (assuming there is muscle in there). Now measure the diameter of your legs. Why are legs bigger than arms? Bringing in magnetic fields to control flywheels by an arm-powered lever is fanciful. Furthermore, levers are essentially a type of gear that increases force by requiring increased working distance. Your net-force over an hour will be the same, because you're having to travel an increased distance for diminished gains. Acting astonished at a statement and pretending it isn't true doesn't make it untrue. Try strapping a 50 pound object to your leg, hold your leg out and see how long you can support it. Then hold the weight with your arm and see how long you can. Supporters of the lie don't care what they say. They are only trying to "convince" those too dull witted to know thy're lying, anyway. I never said "magnetic fields to control flywheels"! I said to embed the flywheel in a magnetic field. Is C elegans even aware that that is how a generator is constructed, by placing conducting coils inside magnetic fields? And, while my idea did not involve levers as such the way C elegans describes, my description only likening the crank to a lever, since the amount of force a lever produces depends on its length, you don't have to "travel an increased distance", just use a particularly long lever! "Levers can be used to exert a large force over a small distance at one end by exerting only a small force over a greater distance at the other." Also, generators CREATE magnetic fields, they do not use magnetic fields to prevent friction as you state. The idea that flywheels will spin indefinitely while creating energy is an afront the laws of energy conservation. "A hand cranked system, working with a form of lever, can start up a superheavy flywheel immersed in a magnetic field so the wheel will keep turning with minimal, sometimes even no, input for a period of time." C elegans doesn't mind demonstrating that not only don't they know what they are talking about, they have no compunction about stringing words together, pretending to know something. C elegans' objection with a lever, which, again, wasn't even what I was talking about, it was only a comparison of sorts with the crank I was suggesting, was that "you" would have to "travel increased distance". I pointed out that, if the operator used the short end, they wouldn't be moving that much. C elegans' "contradiction" was that, if one end of a lever moves a short distance the other moves a long distance. But, again, it was the exertion the operator, "you" was putting in that was the question! And generators do not create magnetic fields! And I was not talking about a flywheel going for an indefinite period because a magnetic field was removing friction! C elegans gives all the appearance of a wantonly confrontational clinical sociopath.